On Friday 3rd August, I will be holding a mandala workshop in Perth. The workshop will be more than simply an introduction to mandalas. We will explore together how they can be used as a spiritual tool in our own personal lives and how they could be used in the faith communities and groups to which we belong. The workshop will commence with a presentation and discussion, followed by a time of meditation and creation of a mandala. We will conclude the evening with some sharing time about the process. Supper will be available during the workshop and all materials will be provided. The cost of the workshop is $30 per person. Registrations are essential as places are limited. To register, please email deepwaterdwelling@gmail.com and payment details will be provided. I will also have copies of my new book "A Mandala a Month Workbook" available on the evening. If you would like to pre-order one before the night this can be arranged. 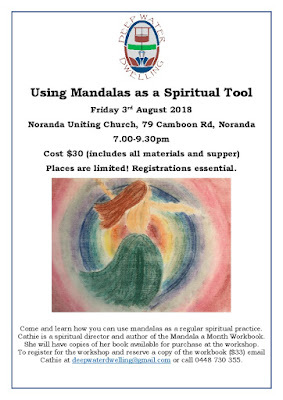 The workshop is at Noranda Uniting Church, Camboon Road, from 7-9.30pm on Friday the 3rd of August. Look forward to seeing you there! !